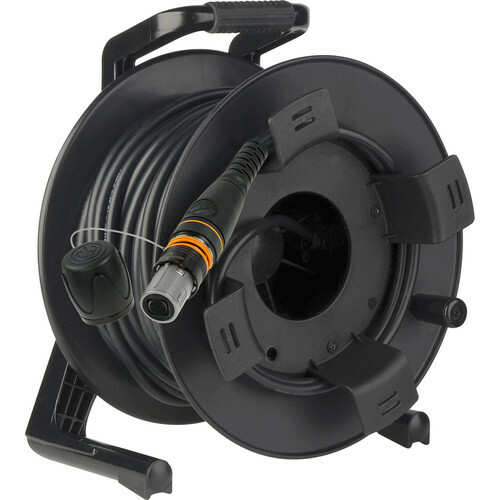 The Camplex opticalCON MTP/MTP OM3 multimode 12 fiber XTREME cable with a Schill GT cable reel and 12 fiber Neutrik opticalCON MTP X-TREME connectors simplifies connections and reduces installation time by running multiple fibers in one cable. This ruggedized Camplex cable saves space for field deployable broadcast AV applications and data transmission over multimode fiber trunks. The opticalCON MTP connectors feature a spring loaded push-pull locking mechanism for reliable operation. Highly flexible, tightly-buffered polyurethane X-TREME tactical cables feature a cut-proof and rodent resistant double jacketed glass yarn armored construction. Machine polished and interferometer tested to industry standards, and dust and water resistant according to IP65 in mated condition. Use with Camplex breakout cables, Camplex MTP NEMA field boxes, Camplex breakout boxes, Neutrik opticalCON MTP chassis connectors NO12FDW-A, and Neutrik opticalCON MTP couplers NAO12MW-A for durability and high performance.